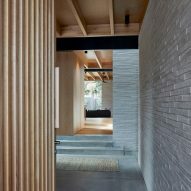 Pale brickwork lines the living areas of this Sydney house by local studio Andrew Burges Architects, while the bedrooms are located in blackened wood volumes on top. 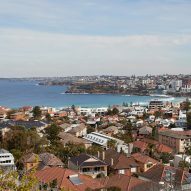 Andrew Burges Architects designed the two-storey Brick House for a family in the city's north Bondi neighbourhood. 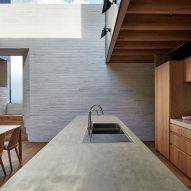 Pale clay brick walls make up the ground floor of the residence, which is occupied by the lounge, and the open-plan kitchen and dining room. Five bedrooms are placed on the floor above in three separate volumes. 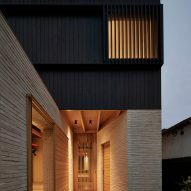 These are clad in burnt ash on the exterior and lined with black-painted wood on the interior to provide a contrast to the brickwork. 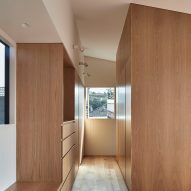 As well as separating the social and private private areas, the layout creates a pair of double-height spaces that act as lightwells to the ground floor. The largest is placed above the dining table and kitchen counter with a brick wall rising nearly the full height of the space. It is topped by a window that is detailed with a minimal window frame so that it appears fully open to the elements. "Large glazed windows above the brick walls are detailed to have no visible evidence of window framing, creating the illusion that all public spaces of the interior are open to the external elements beyond," said the architects. The wall on the other side of the lightwell finishes at the same level creating a balustrade for the walkway on the first floor. The architects wanted the ground floor to remain open-plan. Rather than walls, subtle changes in floor levels and materials delineate the different spaces across the open-plan ground floor. 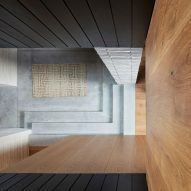 For instance, steps lead down from the dining room to the lounge where the floor changes from oak boards to exposed concrete. A brick fireplace rises on one side of the lounge with large windows set on either side. 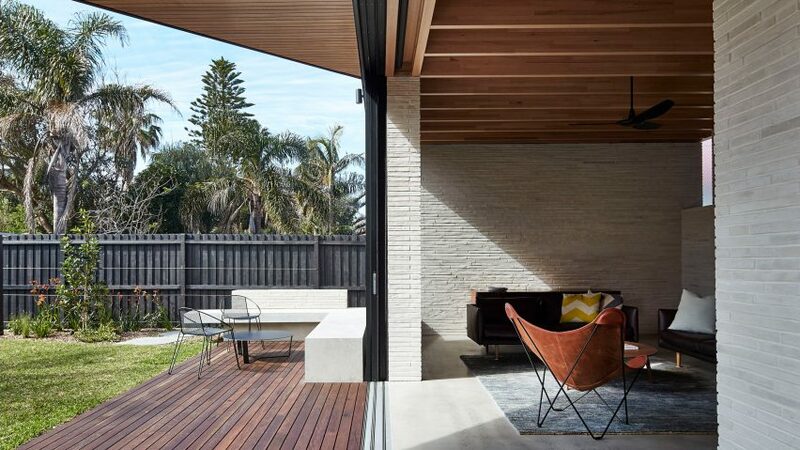 Sliding glass doors run along one wall and open onto a wooden deck at the rear, which features a dining table and seating area. The second, smaller lightwell runs behind the kitchen, bringing light into a lounge. 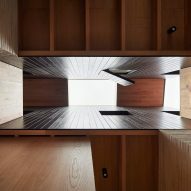 On the upper level, the gap is bridged by a wooden walkway that links a double bedroom and study with the volume containing three bedrooms. 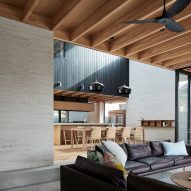 Woodwork details such as the beams that are left exposed under each of the volumes, are used throughout the residence to complement the black wood and pale brick. On the first floor, the walls inside the volumes are painted white. 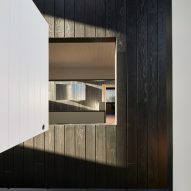 Each features windows that are either open or have shutters, and provide views across the floor and to the spaces below.